Ethereum stays at $284 practically unmovable. Vitalik Buterin denies Jeremi Rubin's assumptions. ETH/USD is trading at $284 at press time. The coin is sitting in a narrow range with a mild downside bias. Ethereum has lost nearly 3% of its value in 7 days time, having decoupled from BTC that demonstrated over 4% growth during the same timeframe. Ethereum's capitalization is registered at $29.2B, while an average daily trading volume is set at $1.9B from $1.2B the day before. Meanwhile, Ethereum's creator Vitalik Buterin has entered into controversy with Bitcoin Core developer and Stellar's technical advisor Jeremi Rubin. He called Ether an economic abstraction and claimed that it would inevitably become worthless. However, Buterin put forward his arguments to deny Rubin's theory. He explained that the Ethereum developer team is continuously working on the network updates to eliminate deficiencies and to keep the coin relevant. 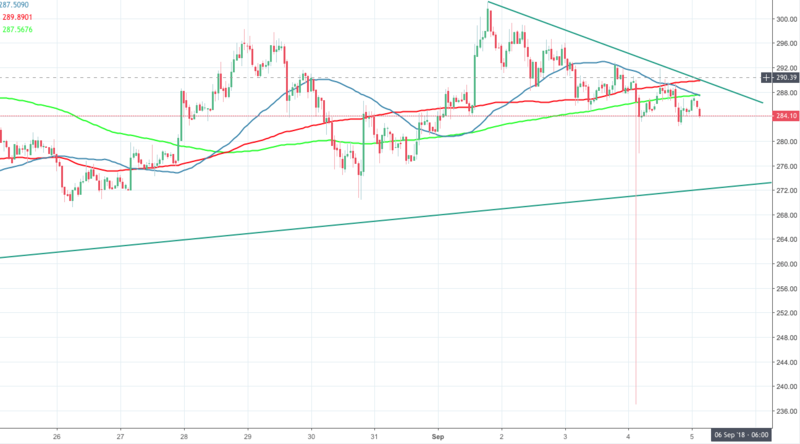 ETH/USD stays below SMA50, SMA100 and SMA200 (1-hour chart) capped by the ultimate short-term resistance registered at $290 (SMA200 and the intraday sloping trendline). Once it is cleared, the price may proceed with the recovery towards $300, where a fresh selling interest is likely to appear. This level is guarded by 61.8% Fibo retracement daily and 23.6% Fibo retracement monthly. On the downside, the support is created by $280, followed by $271 (upside trendline).